Is light rail breaking ground in downtown Vancouver? | Audio and video stories from Southwest Washington. Tom McCloud, owner of PIP Printing, noticed city workers and a Qwest/Century Link crew on Main Street in downtown Vancouver, according to a phone message left July 11. He wondered why Main Street, between 11th and 12th – where his business is located – was closed. The closure impeded vehicular access to his business and he was frustrated. If you have information you’d like to share anonymously, call the anonymous CRC tip hotline, 360-816-1426. Or, if it’s OK to air your comments on COUV.COM, call our “permission to publish” hotline, 360-816-1429. Hotlines go live Aug. 8. Good morning, David. My name is Tom McCloud. 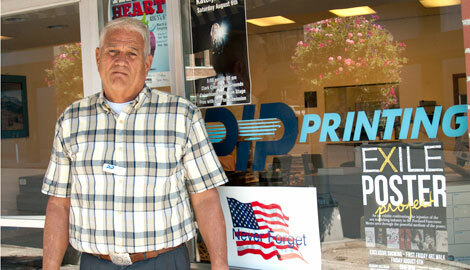 I own PIP Printing in Vancouver, downtown next to the old Kiggins Theater. So, David, it sounds like to me that that’s a foregone decision that’s been made, that light rail is coming. Our vote— if we ever get a vote — probably’s not going to mean anything. But I think that it’s a…I just wanted you to know. I heard your name yesterday on Kremer and Abrams show about your Forensic Accountant, and I applaud what you’re trying to do. Now that the Federal debt ceiling has been raised, I believe Senator Patty Murray has the green light to write a check to the Columbia Crossing project not only for the $850 Million that federal Transportation has already promised, but for a couple of hundred million more. Well, if Patty Murray can come up with the money to operate and maintain a loot rail line for the first year or so, then Clark County and Vancouver city Council can kick that nasty old voting thing down the road for another year. By then, anyone who opposes shutting down the already completed line will be demonized, and Mayor Progressive will have more time to find a way to have as few people vote on the issue anyway. Think it can’t happen?? It has already begun. Down here we have voted no on any more light rail expansion but they continue to build anyway. Now you guys up there are learning that your vote doesn’t matter either. The pols want it, therefore you will have it…. and pay for it! How about suing the City of Vancouver for lost business? You could use Small Claims Court. The Washington limit is now $5000. If you win it would get your point across. I’m not sure what the downside risk would be in suing a city government., since they already have a lawyer employed. But since a lot of businesses will be affected and there is no federal approval for this project yet, perhaps there would be a collective case. You would probably have to find the city contract under which these current changes are being made and show that there is no good reason for them. There is still hope, Clark County! Perhaps an ounce of “ground breaking” is just what our county needs in order to wake up to the reality that there’s more going on here than just the breaking of physical territory. This is a leadership issue. Where there’s a deficit of positive leadership from amongst the people, elected officials will assume a position of dictatorship. Tolerance will be the death of our nation if good people continue to do nothing. Within this diabolical agenda lies a powerful opportunity for Clark County to present a positive model of upright leadership far beyond its borders. It’s not done until it’s done; we can still turn this ship around. Will you ask, “How can I help?” Choose your identity, choose your history. Join us in sharing your voice and educating our community. Contact Couv! I was told this was a set up. No construction worker said this and if you look at the light rail plans it goes no where near main street. You guys walked into this one and took the bait. Conspiracy theories are all you are feeding. Lea, Tiffany Couch and her husband have also checked this out firsthand. We are continuing to investigate this story. So far, we have received conflicting information. The official spokesman for CenturyLink says they are doing this work themselves and paying for it themselves. But the construction workers actually doing the work have stated that it is for light rail. We obtained copies of the work orders that have “street car” printed on them as the official description of the project. We want to follow every lead. If you have information that would offer insight, we welcome it. If unauthorized construction has started in downtown Vancouver, it would mean that the CRC is out of compliance and not following the NEPA process. That has legal consequences. It is too early to determine. We are pursuing the facts. Light rail has been voted on twice and voted down twice by a huge margin. It is clear to me that light rail is not wanted in Clark County. If it is this easy for the average citizen to understand this, why is it so difficult for the politicians to understand this? Do they no longer listen to the voters? If that’s the case, then it’s time for the voters to vote them out and elect people who will listen. It is “We the people” who have the power, and elected officials are supposed to be the servants.